Sakai Guides and DocumentationSakai Complete User Guide AccessibilityHow can I make links accessible? Assistive technology users use link lists to navigate content. This means they cannot rely on context to tell what a link does. Each link needs to be uniquely descriptive of what it does. The best place to uniquely identify a link is in the link text. Good examples are: "View Assignment 34," "Visit Entomological Society of America," etc. Above is an image displaying two tables. In lists where each item has several links associated with it, the temptation would be to create a table like the first example shown above. 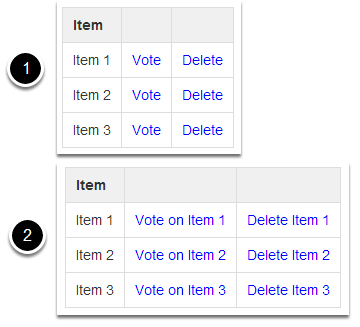 It contains three rows, each containing an Item where you can click a link to Vote for the item or Delete it. Because each item only has Vote and Delete for the links, someone using assistive technology, such as a screen reader, might not be able to tell for which item they're voting. The second example shown would be better, if a bit verbose. Each item's links contain all the information you need to know to select them: Vote on Item 1, Delete Item 1, Vote on Item 2, Delete Item 2, etc. For every HTML web link embedded into the rich text editor that contains only an image and no textual content, concise and descriptive alternative text is mandatory. The alternative text should describe the purpose of the link (e.g., The "destination" that the user will be taken to upon activation of the link.) For more information on adding alternative text to an image, see How can I make images more accessible? Assistive technology users will benefit from knowing what type of file it is they are downloading. When you link to a file in the Rich-Text Editor, include the information in the link text. Prev: How can I make videos and audio files more accessible? Next: How can I make lists of items accessible?